I’m starting to get better at this whole “pie” thing. When I first started my pies looked beautiful but only tasted okay. I had a few mishaps with the crust (too soggy, too dry, burnt…) then had one really bad filling experience (never use hard peaches in your pie!) but I finally think I’m getting the hang of things. For example, I’ve realized that my favorite way to make a crust is with 100% butter rather than using shortening. I’ve learned that there are NO limits to what you can put into a pie (really, none) which makes each experience more fun than the last. I’m finally starting to step out of the “follow the recipe exactly” box and into a more experimental place and I’m pretty thrilled. I was in charge of dessert this Thanksgiving and I knew I wanted to make something special. My family likes pumpkin pie so I used Paula Deen’s recipe for that, my mom requested something chocolate so I whipped up some brownies, and I decided to make something a bit off the beaten path for myself. 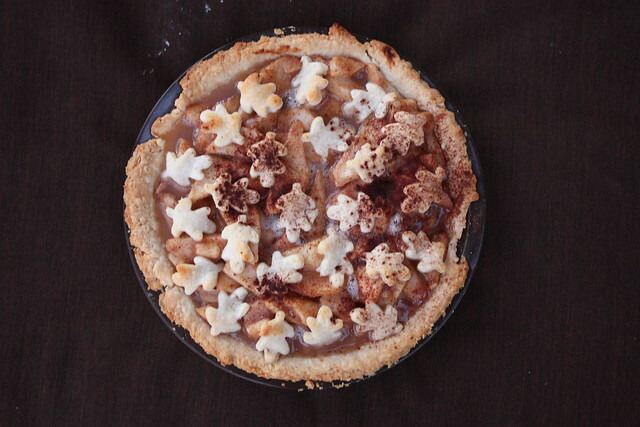 Enter, the Chai-Spiced Pear Pie. 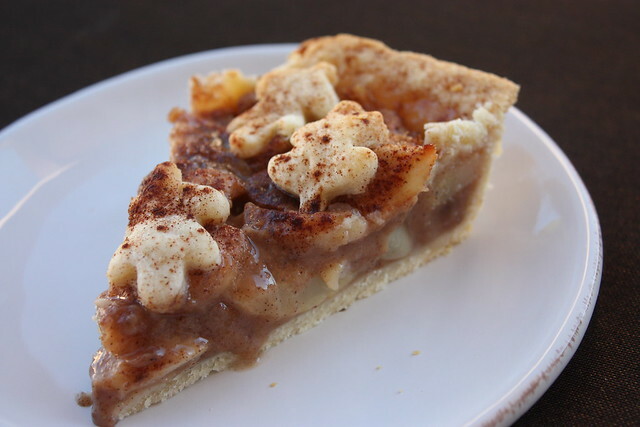 I kind of googled around until I found a mix of chai spices that seemed good to me, then I found some recipes for pear pie to get a gauge on the quantity of pears necessary for my pie. Even though everyone made yucky faces when I told them about my pear pie plans, I forged ahead. And you know what? It was DELICIOUS! It was everything I hoped it would be and I’m so thrilled to have tried something different. So without further adieu, here’s the recipe. Start by preparing your crust. I’ve mentioned in the past that a pastry cutter is a necessary tool for a good pie crust so go out and buy one then come back and get started. Mix your flour and salt then cut in your butter using a pastry-cutter (or forks if necessary). Then, slowly add your ice water one tablespoon at a time, stirring, until your dough starts to come together. Be careful not to overwork your dough. Stop cutting in your butter when there are pea-sized clumps of dough and only mix the water until it is just combined. Break your dough into two halves and flatten into disks. Wrap in cling-wrap and refrigerate for at least 20 minutes. 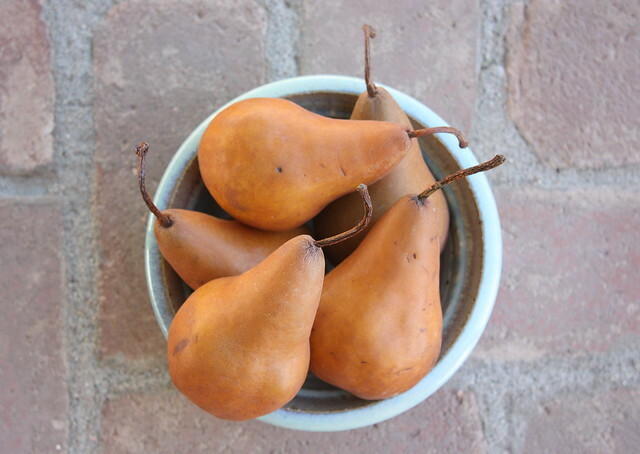 While your dough is chilling, start peeling, coring, and slicing your pears. BE CAREFUL WHEN PEELING! These little guys get slippery and it’s really easy to cut your fingers. This is also a great time to preheat your oven to 450. Next, mix all of your sugar, flour, lemon juice, and spices in a large bowl with your pears. Stir until the pears are evenly coated with your spice mixture. When your dough is chilled, remove one disk from the fridge and roll it out. Carefully place it in your pie dish and press lightly into the edges so it lays flat. 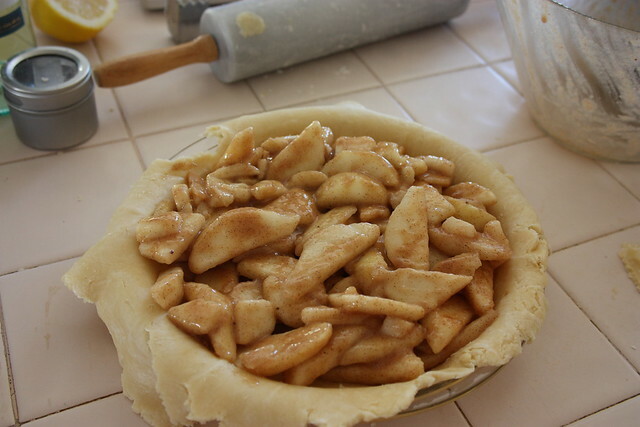 Pour your pear/spice mixture into the bottom crust and be sure to scoop out the extra spices from the bowl. That’s where so much of the flavor is! Roll out your second disk of dough and adorn the top however you see fit. I used a tiny leaf-shaped cookie cutter for my top crust but feel free to make a lattice top or simply roll out a full piece of dough (just be sure to cut some vents in it). Shake some extra cinnamon on top (I did this under a fan so my cinnamon sprinkles are SO uneven). Put your pie in the oven at 450 for 10 minutes. Then, reduce the heat to 350 and cook for another 30-35 minutes. Allow the pie to cool before you dig in. Eat it with some ice cream (might I suggest some salted caramel ice cream?) and enjoy!